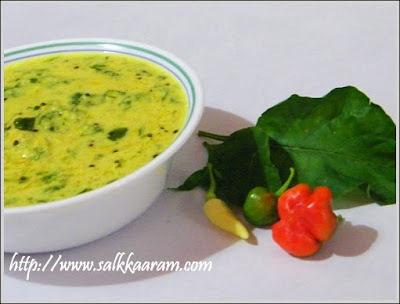 Green Chilly Leaves Curry / Mulakila Parippu Curry | Simple and Delicious ! 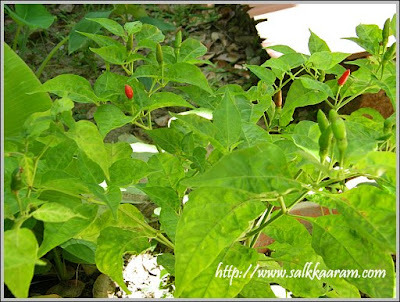 Have you seen a recipe with green chilly leaves? I never thought chilly leaves are edible and we can make such a delicious curry with it.Comparing to spinach, green chilly leaves are little hard in texture, but after cooking it turned softer, and the curry tasted better than spinach or our ordinary cheerayila..
All our green chilly plants turned defoliated after all these experiments.. :) If you have some chilly plants there this is a must try for you..
Wash and Clean the leaves and chop them. Blend together coconut and small onions by adding little water until you get a thick solution. Cook dal with turmeric powder, chilly powder, a little water and salt. Add chopped chilly leaves and cook for 1 - 2 mins. 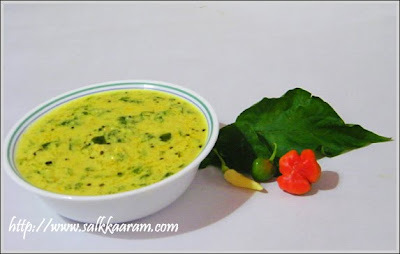 Pour the blended coconut into the leaves and dal mixture. Remove from fire when it starts boiling. Splutter mustard seeds and saute dry red chillies and curry leaves. Add this seasoning into the curry. You can use thick coconut milk instead of coconut paste. But blended coconut solution gives a thick texture to the curry. I've never had green chilly leaves! The curry looks yummy! Me too never ever thought that these leaves could be used like this. Love the colour of the dish and i am sure it tasted delicous too. ithu oru puthiya kandupiduthamanallo.definitely il try this one. Such a new idea and experimentation! But curry looks yummy! Wow... fantastic recipe Seena...But Mulakila kittanaanu paadu.. as we are gulf expats..huh.. anyway for sure will try during the coming vacation.. Thank u so much Seena.. I have heard so much about cooking chilly leaves that I cannot resist buying a bag of chilly leaves in the flea market in Auckland, NZ. However,they are capsicum leaves. I think that is not a problem as the smell like chilly leaves. My own chilly plant is bald or have only a few leaves. This bag I got has at least 10 cups in volume.